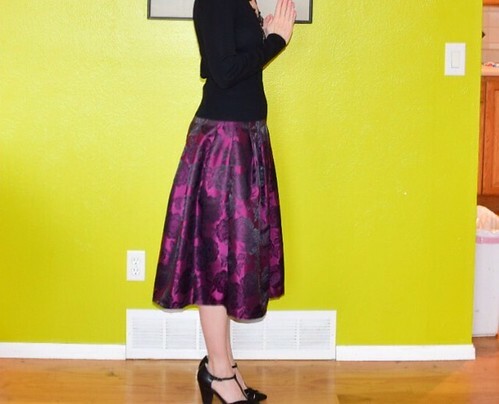 Finished my McCalls 7253 skirt awhile back. Finally wore it at a my mom’s birthday dinner. Gotta say I love it! 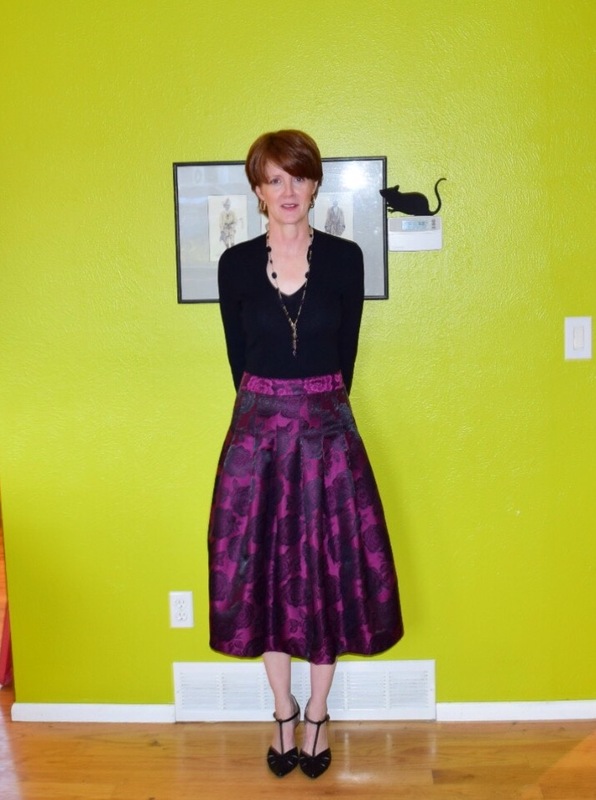 Love the box pleats, love the fabric I picked out from Colorado Fabrics, love it all. Certainly a keeper. I lengthened it a bit because I wanted a classic look to it. But, I’m sure the shorter version would be cute. I lined it with a black silk charmeuse. I think next time I might put the zipper on the side to keep the back pleats looking more evenly placed. After the initial pressing of the pleats by the time I wore it they came undone a bit. My pleats aren’t has crisp as the one on the McCalls pattern envelope or as long. 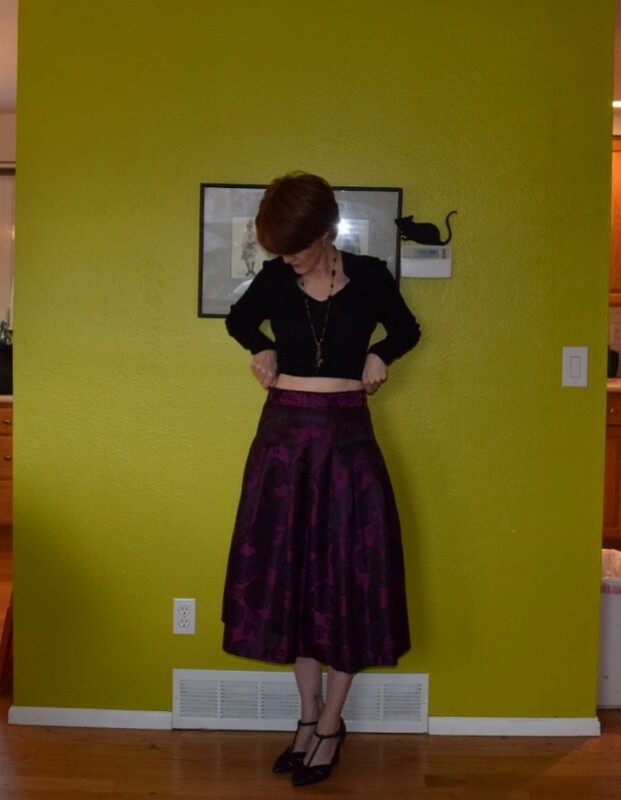 It has a nice high waistband with a bit of contouring to it, so you’re not sewing a rectangle. At one point I forgot to check my iron setting and melted a bit of fabric. Fortunately it wasn’t part of the skirt pieces. The pattern stitched up quick and cute. 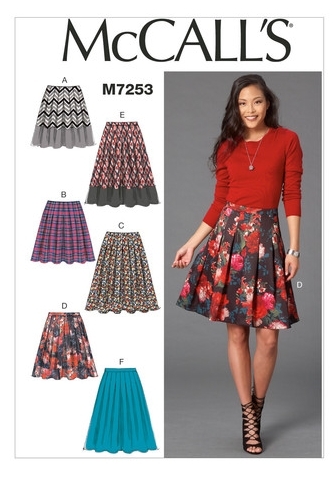 It’s the type of skirt that you just love wearing, it has an elegant feel to it but it’s really fun at the same time. Just love it! View of the waist band and you can see the pleats could use a bit more pressing. Previous Hey, Jill! Whatever Happened To That Core Wardrobe? Very nice! It really looks great on you. Absolutely lovely Jill. Great job. 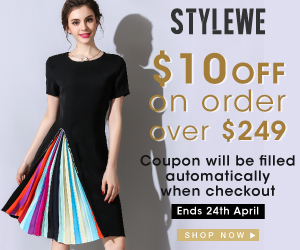 What a beautiful skirt, very elegant! Have you ever set pleats with white vinegar? Test first, of course and I have used this on many types of fabrics, washable and not. Dilute white vinegar in a spray bottle. Spray on the pleats and press to set. Let the pleats cool and dry before moving. No, I haven’t. I’m trying it next time I wear it! I think it will look a lot better. I love it, very classy. I like side zippers a lot also. I had a back photo and I should have kept it, but I trashed it. But, the zipper placement accentuates the back side, not in a good way. It’s weird. Lovely fabric and shape. Perfect shoes too! It’s called Colorado Fabrics, it’s located in Denver! I don’t sew professionally. But, I know many who do if you need a recommendation.